Pacific Northwest Ballet Soloist Sarah Ricard Orza in Jessica Lang's "Her Door to the Sky"
Lang’s new dance, commissioned by Pacific Northwest Ballet and Jacob’s Pillow, had its world premiere last year at the Pillow. But I can’t imagine summer dance fans there could appreciate this ballet the way we sun-deprived Seattleites did. It was a sensory cornucopia, from Benjamin Britten’s score to Bradon McDonald’s luscious costumes. “Her Door to the Sky” capped an evening of glorious contemporary work, PNB’s latest “Director’s Choice” program. 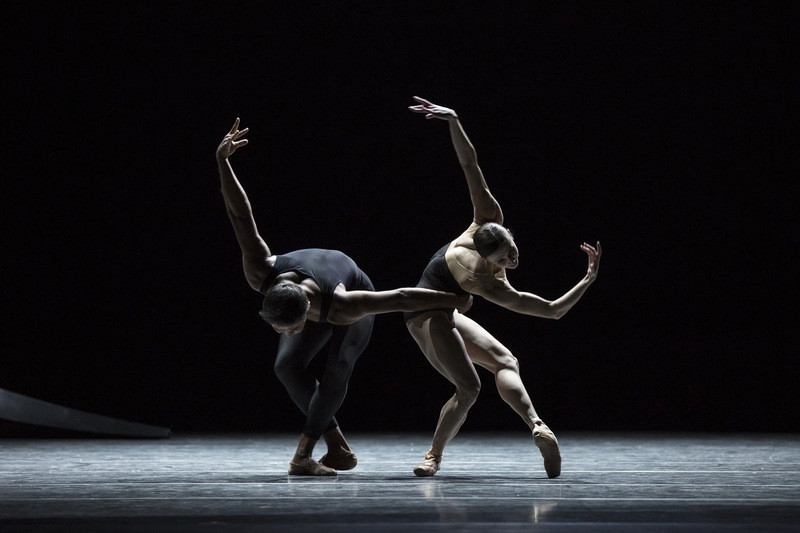 PNB Principal Dancer Batkhurel Bold and Corps de Ballet member Elle Macy in David Dawson's "Empire Noir"
Relentless indeed, although I felt more spiritual uplift than void of madness when it ended. “Empire Noir” is danced under an immense set piece created by John Otto. It looks a bit like the Nike swoosh, or a large dark ellipse, and looms over the dancers, just a bit off center. In many respects the choreography echoes the elliptical shape. Dancers orbit onstage from behind the ellipse. Their movements also swoop; from the dramatic lifts, to the repeated outstretched arms, hands bent at the wrists. PNB Principal Dancers Karel Cruz and Lesley Rausch in "Empire Noir"
“Empire Noir” demands ferocious energy and immaculate technique and PNB’s impressive cast delivered. No single performance stood out, although Lesley Rausch seems born to dance these contemporary works, and Batkhurel Bold looked as good as I’ve seen him in years. If “Empire Noir” pushed the dancers’ stamina and strength, the second offering on the bill, a reprise of William Forsythe’s lyrical “New Suite,” demands something subtler, and perhaps more difficult: a complete technical mastery and the confidence to perform without a net, or at least without a bevy of dancers to mask your mistakes. PNB Principal Dancer Lindsi Dec with Corps de Ballet member Miles Pertl in "New Suite"
“New Suite”is a sequence of eight duets set to music by Handel, Bach and Berio. PNB premiered this work in 2015, on an all-Forsythe bill. It was lovely then, and remains so, a bit of a palate cleanser after Dawson’s dynamic ballet. On opening night principal dancers Carrie Imler and Jonathan Porretta demonstrated the benefits of their experience, artistry and mutual trust, in the final Handel pas de deux. Truly, these two are at the height of their skills. But at the Saturday matinee it was quite wonderful to see young corps de ballet members Angeli Mamon and Dammiel Cruz, and Cecelia Iliesiu and Miles Pertl, shine. Their prowess gives me great hope for PNB's future. in "Her Door to the Sky"
As much as I loved the first two ballets, it’s Lang’s piece that I still see in my mind’s eye. From the bright white of the mid-day sun, to the blueish-purple desert twilight, Lighting Designer Nicole Pearce evokes the New Mexican light so well that you feel the weight of Seattle’s wretched wet winter slide away. The set, a recreation of the adobe wall that inspired O’Keefe’s patio paintings, is not a simple backdrop. Lang moves her dancers behind it, on it, and through it, setting up both moments of humor and poignant emotion. “Her Door to the Sky” is an ensemble piece, but at its center is a woman, danced by soloist Sarah Ricard Orza, around whom the energy flows. 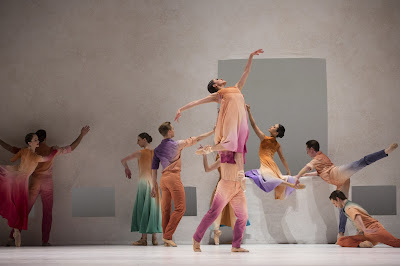 Orza enters through a center window, drops back into the hands of five male dancers, who twirl her body like a baton, then raise it up, supplicants in awe of a higher power. Meanwhile the four other women enter behind the adobe wall, stopping at each window to look in on the action. PNB company members in Jessica' Lang's "Her Door to the Sky"
Jessica Lang says this ballet is meant to celebrate the long history of female creativity. For me, it is also a gentle reminder of the ever-present beauty that surrounds us, if we only take a moment from our frenzied routines to stop, look, and soak it all in. "Her Door to the Sky" couldn't be more different in tone from "Empire Noir," but taken together with Forsythe's "New Suite," this is a program that reminded me once again why the arts are so important in our lives. Lucky you; “Director’s Choice” is at McCaw Hall March 23-26th. Aww mind-blowing ballet dance.I appreciate everyone's effort including performers, director and choreographer.I liked this beautiful post and suggest you to buy good top essay writers for more refine writing skills.Good effort done seriously.